This book seeks to address the roots of the hostility that has characterized the United States’ relationship with Cuba and has persisted for decades, long after the Cold War. It answers the question of why America’s Cold War era policy toward Cuba has not substantially changed, despite a radically changed international environment, going beyond the common explanation that American electoral politics and the Cuban lobby drive US policy toward Cuba. 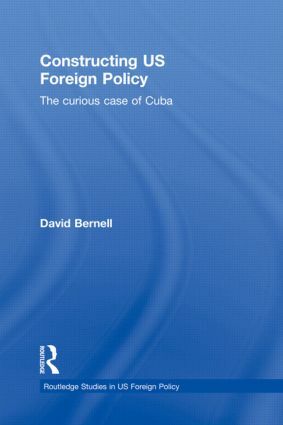 Bernell argues that US foreign policy towards Cuba cannot be viewed as an objective response to a set of challenges to US interests and principles, and is better understood as a policy that is rooted in and informed by historical understandings of American and Cuban identities, which are themselves historically contingent. Examining a wide range of sources including government documentation and official speeches, this work explores the origins and perpetuation of a policy perspective that emphasizes Cuban difference, illegitimacy, and inferiority juxtaposed against American virtue, legitimacy, and superiority. This work will be of great interest to all scholars of US foreign policy, International Relations, and Latin American politics. David Bernell is Assistant Professor of Political Science at Oregon State University, where he teaches and conducts research in international relations, United States foreign policy, and international political economy. He is the author of Readings in American Foreign Policy: Historical and Contemporary Problems (2008), and also consults for the renewable energy firm, Think Energy, Inc. This new series sets out to publish high quality works by leading and emerging scholars critically engaging with United States Foreign Policy. The series welcomes a variety of approaches to the subject and draws on scholarship from international relations, security studies, international political economy, foreign policy analysis and contemporary international history. Subjects covered include the role of administrations and institutions, the media, think tanks, ideologues and intellectuals, elites, transnational corporations, public opinion, and pressure groups in shaping foreign policy, US relations with individual nations, with global regions and global institutions and America’s evolving strategic and military policies. The series aims to provide a range of books – from individual research monographs and edited collections to textbooks and supplemental reading for scholars, researchers, policy analysts, and students.